Our decision to organize our annual Auction (join us on October 17th) around the theme “Heroes” is partly about having fun – think of the Xena, Wonder Woman, Spider-Man, Harry Potter costume options – and partly, perhaps, a reflection of people’s need for hope and comfort in these chaotic times. To whom can we look for inspiration? What memories or stories console and energize us? Ask the next five people you meet who their heroes are and why: I’ll bet you’ll hear a combination of historical and fictional figures, leavened with a sizable sample of relatives. His mother; her grandfather; big sister, inspiring niece. We seem to swoop back and forth between the intimate, familial stories of accomplishment and perseverance, and the outsized and sometimes improbable attainments of power and salvation. My first reaction was to think of my maternal grandmother. That’s not going to help with the costume, as she was a librarian. I’m fashion-challenged enough without succumbing to stereotypical frumpishness. But how she became a librarian, and what that meant for her, for thousands of people in some rural areas of California, and for me – now that’s an heroic story. Lois Magee was 40 years old and living in Taft, CA (pop. 3700, charm nonexistent) with two teen-age children when her husband died in 1953. To make a living for herself and her family she transformed a lifelong passion – reading – into a job and then a career. She got a job in the local library, then obtained a Masters Degree in Library Science. Eventually she became County Librarian of Kern County, overseeing one of the most geographically wide-ranging library systems in the state. And always, she spread her passion for books and learning wherever she went, to whomever she met. She taught me, and thousands of library patrons in the various libraries she staffed and visited, the wonders to be found in books. She opened windows into escape, solace, adventure and learning. Whether it was introducing children to their first “big book” or answering obscure questions from folks wandering down research pathways, she never forgot the joy inherent in one’s first exposure to the magic of the library. And she always had a sense of humor about it: she laughed every time at the hysteria Marian the Librarian falls into when the Music Man wreaks havoc in her quiet library, and she worked hard to balance the “SSSSSHHHHHHH” of library lore with the noise that necessarily accompanies the “AHA” of a new fact learned or a great idea assimilated. 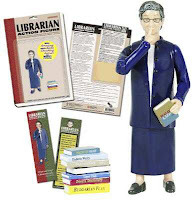 I still don’t know how I’ll manifest the Heroes theme at our Auction (though you can count out both breastplates and a dowdy suit), but I do know a hero when I see one, so here’s a shout out to my grandmother and to all the librarians who embody her spirit. Check out one of my current favorites, Mary Whisner, and don’t miss her blogs -- they're fun, informational and best of all, you don't have to know the Dewey Decimal System to enjoy them.